Aqareb wheeled armored vehicle appears to be a heavily modified BTR-60, featuring a turett-mounted 90 mm main armament and a secondary armament consisting of a DShK machine gun attached to a cylindrical armored firing station. Opposite view of the Aqareb armored car. Project may be an attempt at improvising an armoured reconnaissance fire support vehicle. Fallagh ("Twilight") ultra-light tracked vehicle: claimed capable of travel at a maximum speed of 100 km on unpaved surfaces, and 130 km on paved roads. Vehicle is said functional with automated 12.7 mm gun and stabilizer, with a weight of 4 tons. Nazeer ("One who warns") combat unmanned ground vehicle, claimed capable of equipping with 7.62mm machine gun and two MANPAD type missiles, or two anti-armor missiles and carry 600 kg payload. Claimed operational radius for first phase of development is 2 km. Baher 23 mm gun, specified as a "sniper rifle" and "anti-helicopter weapon." Claimed weight is 24 kg, with an effective range of 3 km. 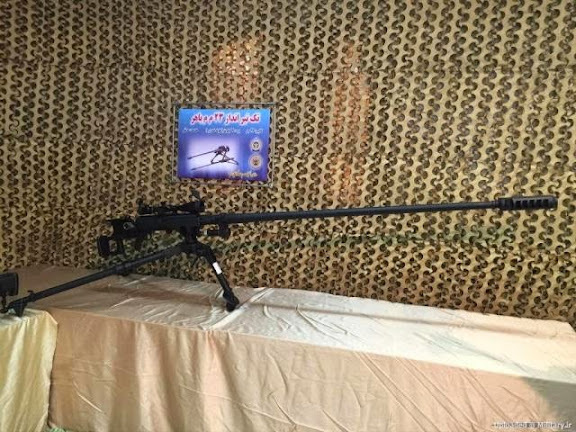 New variant of Shaher 14.5 mm anti-material rifle, with telescopic sight and side-mounted magazine. Claimed specifications include 24 kg weight, 5-round magazine and effective range of 3 km. The Aqareb with the 90mm gun looks like it was cobled together in a back street workshop while coming under intense enemy bombardment. Either build something worthwhile or save us the embarrasment by not showing it at all. Is this for real?! After all the investment in their defense industry this is what Iranian engineers and designers can come up with? I can't imagine anyone suggesting these are modern effective armaments. So sad. This shows the lies of Iran defence industries when they claim Creation of indigenious advanced weapons of various kinds, is nothing but hoax. All the knowledge, equipment, compontents in these so called "made in Iran" actually come from China. 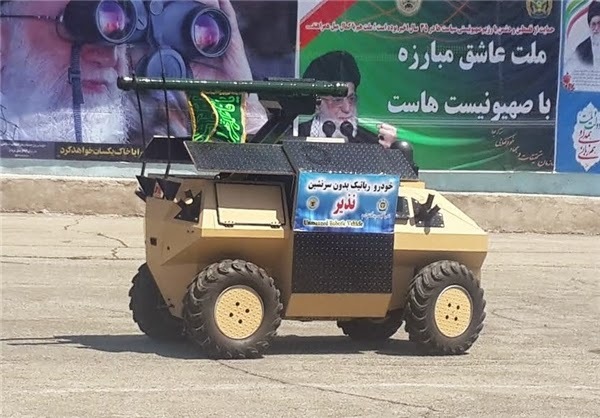 Truth is that Iran military and weapons industries can make just a world war two look a like vehicle. None of the munitions, rockets, bombs, missiles etc none is designed by Iranians, all Blueprints come from China. So much lies from Irans regime down through every departement on every level. I'm fed up with these 'unveiling"! I'll pay the ministry of defense the compliment of assuming that these are unfinished projects or test beds. The so called "tanks" look like they were assembled somewhere in a high school! I thought DM Dehghan put an end to this bad policy of the ministry of defense when he took office! 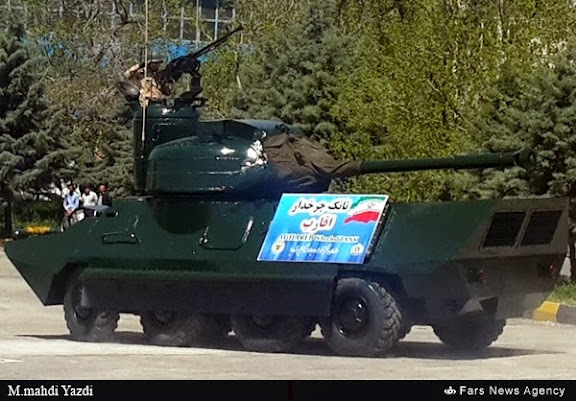 Typical shortsightedness and counterproductive propaganda designed at the less educated layers of society within Iran itself, who would awe in front of an ugly and ineffective customized 60-year-old tank with a new paint job, a modern solid-fueled MRBM or a Cruise missile equipped Frigate with AESA radars, or a HMS with ATGMs mounted on an attack helicopter alike. This kind of press, though technically harmful (if not catastrophic) to the image of Iran's self-sufficiency efforts, claims and genuine achievements is sadly the unavoidable, tacit , toxic implication of dealing with the "Goebbelsian" attribute of the theocracy using every possible piece of technical-related news to show it off in an almost childishly naive fashion... I mean, who would react in any other ways than grinning, laughing, (or face-palming in embarrassment like I did by browsing that post) at the sight of these third-rate piece of workshop equipment ? If anything it shows the utter disregard that the IRGC establishment has towards various branches of the conventional ground army branches, NEJAZA truly is an exemplification of an under-quipped force by all standards in comparison to regional armies (with or without a homegrown industry, at this point we cannot care less) and to the Pasdaran whom are in charge of virtually everything up to date in Iran and with a clear strategic meaning, ranging from precision ballistic missiles, layered air defense, and continuously evolving modern armor and navy. In that regard, even an individual with close to zero military culture or knowledge can make drastic distinctions between the aforementioned "achievements" and say, a Zulfiqar-3 prototype or various M109 variants that are upgraded, modified, refurbished or rebuilt by DIO uses and shares with its Iraqi allies, or heavy duty vehicles for BM launchers and air-defense batteries... jeez, the army is not even a direct beneficiary of the Defense industries' R&D, let alone its end-products... one has to learn to think "Pasdaran army" whenever it comes to Iran's most advanced and relevant piece of hardware and technologies.... and "IRGC's Iran" when referring to the "Iranian armed forces". A self-interested privileged state within a state indeed, it has never been so damn true. Hang on guys. The theater of war is not exactly Geneva Motor Show and a defense asset does not need to look good. What matters is whether it can do the job as expected. Case in point Safir utility Jeep is not exactly a great 4-wheel drive but has been very successful and battle tested in Iraq and elsewhere. I recall American troops were using metal bars as extra protection on their tanks in Iraq. The same goes today. Iraqi seems to be better off with T-72 tanks than the US Abraham tanks. There is nothing wrong with being simple as long as the tool can deliver. With regard to many of these weapons, the Chinese ones are copies of Russian or French ones. The C802 cruise missile was based on the French Exocet missile and Iranian have taken it and improved it. When Hezbollah used the Iranian version of C 802 missile against the Israeli frigate, it actually did what it was supposed to do. No one on the Israeli side laughed at it. my point was rather that all the good and nice modern equipment emanating from DIO's engineering efforts are primary if not exclusively meant for the IRGC and not the army. The Artesh remains an notably underdeveloped force and is not a beneficiary of the fruit of Iran's constant advances in homegrown weapon systems manufacture. The budget is not there, the political will is not there, and we're stuck at the bad old mantra of fear and suspicions of the Mullah towards its own armed forces, Saddam style, and systematically preferring strengthening of its own private , second army in the country that is the Pasdaran, and that is reminiscent of the way the theocracy works : for its own, and no one else. I am the first to often quote the C-802 anecdote to the many participants on this blog that use to gratuitously and cheaply berate any probable capability of Iran in acquiring credible means to defend itself without being able to produce an ounce of documentation or facts to support their statements beforehand, but once more what do we have in that particular example ? Hezbollah, a Lebanese pendant of the IRGC and its load of anti-ship cruise missiles and Fateh-110s. The same phenomen, coupled with a budget strained by international sanctions, prevents the air-force from going all-in for mass modernization, and instead does minimal, very modest incremental steps at budgeting its projects that shadow its real potential in aerospace engineering. I can understand the strategic logic behind the regimes preference for ballistic missiles, but it has long past the downhill phase of progress in this field, plus with the recent events surrounding the S-300 and Putin, that justification doesn't even stand for air-defense. We are not here to talk like philosophers by saying not to judge a tank based on appearance because appearance tells a lot about functionality which is also the case of so called Qaher F-313 fighter jet or Hamaseh UAV as an example. 1- Protection for the crew (slope of the body, armour thickness and material, etc). 4- Battle field quick maintenance (Engine and parts). In addition to these a modern tank must have night vision camera, infra red thermal imaging system, fire control and stabilization gyro system, laser range finder and in more advanced versions. automatic gun loader and tactical monitoring and GPS display for tank commander being tactically aware about the position of friendly and foe. not mentioning smoke masking grenade and mine field detonators. Now, please tell me, the barrel so called Aqareb has which one of the above characteristics. They have put the machine gunner outside the tank inside a barrel. The people made this junk did know nothing about tank wars and tank design. They had an engine, chassis and wheels which they want to just put something on top of it. 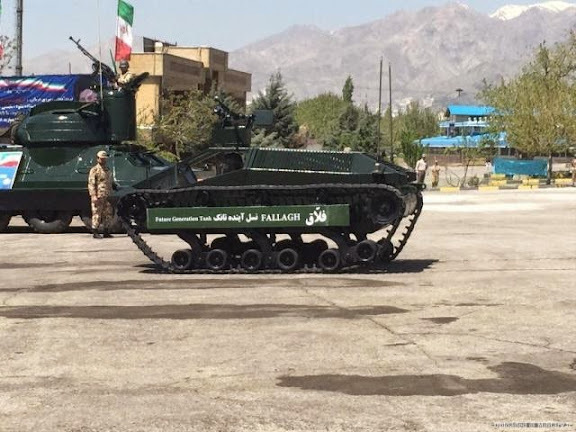 This is the same engine and track for previously introduced armour personnel carriers called Hoveyzeh and Talayeh. Trust me my friend by sending this to a battlefield they would be sitting docks for American M1 Abrams to explode them one after another as if they are playing a video game as they did in first Persian Gulf war against Iraqi T72 s with one major difference at least you could call T72 a tank. 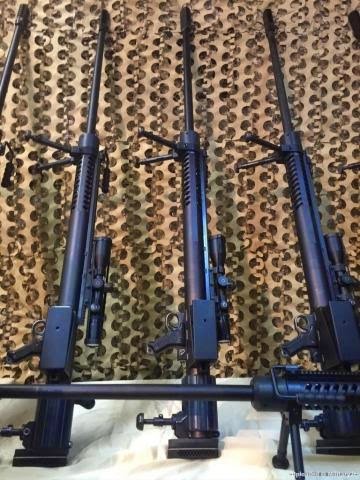 I make my point again: These are not effective weapons against any insurgents, smugglers, or bandits. Showing off dilapidated, old and useless armament as modern leads one to question other claims by IRN. I guess IRN still has a very long way to go before it can design and produce effective weaponry. Still very sad for a country with such a proud and vibrant people. I guess it is expected though since even research and development (R&D) is politicized in IRN. 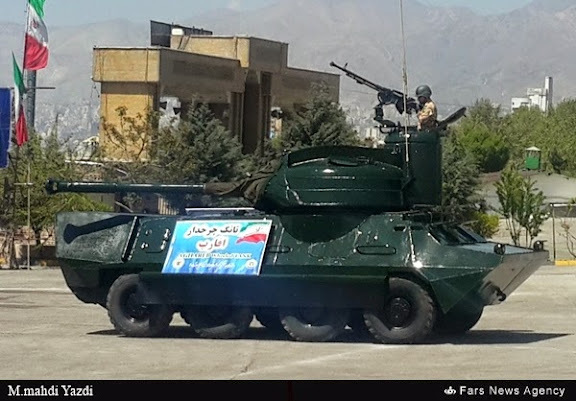 This Aqareb contraption ( Honestly I don't know what to call this seemingly useless piece of military junk) is by far the most ridiculous design ever to appear on this website .If possible , please designate a special category for such questionable systems under military section for Iranian Armed forces . Anything related to effective, demonstrated designs like ballistic missiles, air-defense, airborne radars for F-14s and Cobras, PGMs + ATGMs upgrades/copies/new designs fall within the IRGC's authority and hence exclusive disposal. Quite an expected situation considering it pretty much owns every weapon infrastructure ranging from light ammo production sites to advanced missile & radar design centers like sprawling EIE infrastructure responsible for Iran's unique, latest OTH and other ground-based search & track radars and tropospheric communications, once controversial Parchin research site or Bandar Abbas and Anzali's major naval construction ports for Iran's latest frigate projects with AESA radars and soon CIWS. Wherever it comes to the Army ("Artesh" in persian) things dramatically change and we find ourselves presented with the joke of a pseudo "self-sufficient department" more on par with on-the-fly odd-jobs done by what is left of Iraqi design capabilities in the war-ravaged country rather than what the DIO makes in Iran. We are there literally worlds apart. "I guess it is expected though since even research and development (R&D) is politicized in IRN." ==> exactly my point all along : politicized and completely biased in the Pasdaran's favor, courtesy of Khatam ol Anbia's wildcards everywhere in Iran's industry and economy.